Honeycat Cookies: Muscovado and Balsamic Pecans: Recipe! 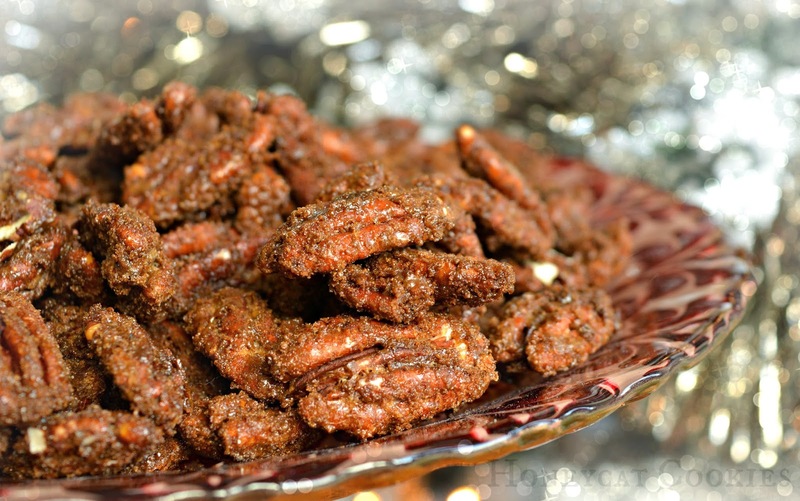 Muscovado and Balsamic Pecans: Recipe! I know, I know, I have a thing for balsamic vinegar. Yes, I'd probably drink it if I couldn't find something better to do with it. And using it to make candied pecans is undoubtedly better. I make these on a regular basis, and it doesn't matter how much I make, they get picked at and picked at until they're gone. You can't just eat a small handful. If you make them, you'll probably not want to plan anything for tea. These are less heavy on the sugar than the orange, honey and ginger cashews I did last year, and have a richer darker flavour due to the dark muscovado. They're also a lot simpler to make as they don't involve zesting any citrus fruits, which is a tiresome job at best. I really don't like all the faff involved in cooking. I shouldn't be allowed near a food-based blog really. Mix the sugar, salt and spices in a large bowl. I find the muscovado a little lumpy as it comes out of the packet, and two* sticky to sieve, so once the spices and salt are in, I just mix through with my fingers, rubbing until the mixture is fine and loose. Whip up the egg white to a thick froth, add the tablespoon of balsamic vinegar and whip that in until it becomes stiff. Toss the pecans in the mixture until they are all thoroughly coated. Then tip the whole lot into the bowl of sugar and spices. Again, toss them through until all the sugar has become wet through and all the pecans are coated. Bake in a low oven (I use 120c fan) for one hour, turning them over and around every quarter hour. Turning is important as otherwise the sugar mixture can bake in a 'meringuey' sort of texture. Tossing them through roughens it all up. Leave to cool until you can bear to touch them, then gently pull the nuts apart with your fingers. (If you leave them too long, they stick together and break when you try to pull them apart.) Store in an airtight container for a while, or eat. Honestly? I've never had any left to test how long they stay crisp for. Perfect for Christmas, New Year, or little Honeykitten's Nearly-Christmas-Birthday parties. 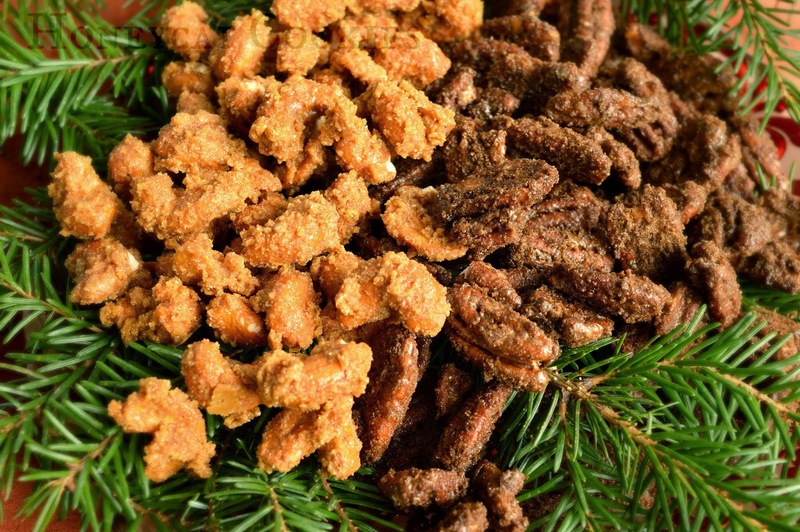 Try serving up a mixture of nuts on a bed of spruce clipped from the tree - wonderful spicey, Christmassy scents! How many nuts do you add to this recipe? Oops! Thank you - I shall edit! It's 1lb of nuts. Thank you! These were a huge Christmas Eve hit! !